Recent construction for Interstate Highway 99 (I–99) exposed pyrite and associated Zn-Pb sulfide minerals beneath a >10-m thick gossan to oxidative weathering along a 40-60-m deep roadcut through a 270-m long section of the Ordovician Bald Eagle Formation at Skytop, near State College, Centre County, Pennsylvania. Nearby Zn-Pb deposits hosted in associated sandstone and limestone in Blair and Centre Counties were prospected in the past; however, these deposits generally were not viable as commercial mines. The pyritic sandstone from the roadcut was crushed and used locally as road base and fill for adjoining segments of I–99. Within months, acidic (pH<3), metal-laden seeps and runoff from the exposed cut and crushed sandstone raised concerns about surface- and ground-water contamination and prompted a halt in road construction and the beginning of costly remediation. Mineralized sandstones from the cut contain as much as 34 wt. % Fe, 28 wt. % S, 3.5 wt. % Zn, 1% wt. Pb, 88 ppm As, and 32 ppm Cd. A composite of <2 mm material sampled from the cut face contains 8.1 wt. % total sulfide S, 0.6 wt. % sulfate S, and is net acidic by acid-base accounting (net neutralization potential 234 kg CaCO3/t). Primary sulfide minerals include pyrite, marcasite, sphalerite (2 to 12 wt. % Fe) and traces of chalcopyrite and galena. Pyrite occurs in mm- to cm-scale veinlets and disseminated grains in sandstone, as needles, and in a locally massive pyrite-cemented breccia along a fault. Inclusions (<10 μm) of CdS and Ni-Co-As minerals in pyrite and minor amounts of Cd in sphalerite (0.1 wt. % or less) explain the primary source of trace metals in the rock and in associated secondary minerals and seepage. Wet/dry cycles associated with intermittent rainfall promoted oxidative weathering and dissolution of primary sulfides and their oxidation products. Resulting sulfate solutions evaporated during dry periods to form intermittent blooms of soluble, yellow and white efflorescent sulfate salts (copiapite, melanterite, and halotrichite) on exposed rock and other surfaces. Salts coating the cut face incorporated Fe, Al, S, and minor Zn. They readily dissolved in deionized water in the laboratory to form solutions with pH <2.5, consistent with field observations. In addition to elevated dissolved Fe and sulfate concentrations (>1,000 mg/L), seep waters at the base of the cut contain >100 mg/L dissolved Zn and >1 mg/L As, Co, Cu, and Ni. Lead is relatively immobile (<10 μg/L in seep waters). The salts sequester metals and acidity between rainfall events. Episodic salt dissolution then contributes pulses of contamination including acid to surface runoff and ground water. The Skytop experience highlights the need to understand dynamic interactions of mineralogy and hydrology in order to avoid potentially negative environmental impacts associated with excavation in sulfidic rocks. 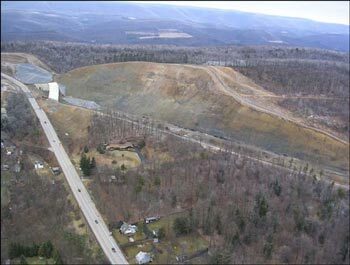 Aerial view of the Skytop cut on January 6, 2005 looking north. Existing Route 322 in foreground. Future I–99 roadbed runs along the base of the cut. Black plastic covers one of several areas of pyritic fill as a stopgap measure to minimize water infiltration.